Cranio-Sacral Therapy is an Osteopathic technique in which gentle manipulation of the cranial bones and the “Cranial Rhythm” is used to balance and regulate the body…. Time: 10:00am. Address: 40 Exchange Pl. Venue phone: (212) 685-2848. Traditional Tui Na is offered as a package of 4 weekend seminars. Register now for all four classes via the link below. Time: 10:00am. Address: 80 Eighth Avenue. TO REGISTER: Contact Association Sanqi. Time: 10:00am. Part 2 of two weekend series: Sept 8-9, 2018 & Oct 13-14, 2018. Time: 6:30pm. Admission: TBA. Venue phone: (503) 737-5025. Ba Gua Zhang with Tom Bisio in Portland. Details coming soon. $175 THIS CLASS IS NOW FULL Related post. 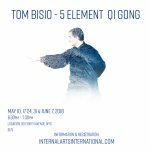 Xing Yi Intensive with Tom Bisio, Valerie Ghent & Wes Tasker. For intermediate/advanced students. This class is now full. Zang Fu Tui Na is offered as a package of 4 weekend seminars. Sign up today for all four weekends! Cost $1950. TO REGISTER: Contact Marilyne Meloche. TO REGISTER: Contact Pascal Jauffret. Time: 2:30pm. 6 days of intensive training in Ba Gua Zhang. Instructors: Tom Bisio & IAI senior instructors. Time: 9:00am. Venue phone: (503) 737-5025. REGISTER NOW or Contact info@portlandshaolin.com. Time: 10:00am. Admission: $695. Address: 40 Exchange Pl. Venue phone: (212) 685-2848. This is a 3-Day Class. Class limited to 20. Fri. 10am-5:30pm; Sat. 10am-5:30pm, Sun. 9am-4:30pm. Cost: $700 for two weekends. 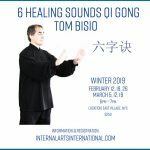 Instructor: Tom Bisio & NYIA instructors. Time: 10:00am. Xing Yi Instructor Training with Tom Bisio, Valerie Ghent and Wes Tasker. For advanced students. This class is now full. Cost: $1200 for all three weekends. TO REGISTER: Contact Tom Bisio. Time: 10:00am. This is a 5 weekend intensive course. Jan 16-17, March 5-6, June 11-12, Sept 24-25, Nov 19-20 $1000 for five weekends. 10am-1pm Sat/Sun. Instructors: Tom Bisio & Valerie Ghent. Time: 10:00am. This is a 5 weekend intensive course. Jan 16-17, March 5-6, June 11-12, Sept 24-25, Nov 19-20 $1000 for five weekends. 2pm-5pm Sat/Sun. Instructors: Tom Bisio & Valerie Ghent. Time: 2:00pm. This is a 5 weekend intensive course. Jan 16-17, March 5-6, June 11-12, Sept 24-25, Nov 19-20 $1000 for five weekends. 2pm-5pm Sat/Sun. Instructors: Tom Bisio & Valerie Ghent. Time: 2:00pm. This is a 5 weekend intensive course. Jan 16-17, March 5-6, June 11-12, Sept 24-25, Nov 19-20 $1000 for five weekends. 2pm-5pm Sat/Sun. Time: 10:00am. This is a 5 weekend intensive course. Jan 16-17, March 5-6, June 11-12, Sept 24-25, Nov 19-20 $1000 for five weekends. 10am-1pm Sat/Sun.